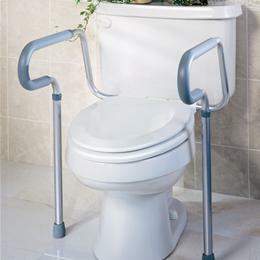 Toilet Safety Frame: Handles Are Adjustable And Rotate Back To Allow A Wide Range Of Comfortable And Secure Positions. Closed Cell Foam Armrests Provide A Comfortable, Sure Grip. Adjustable Height 26"-31" (66-74Cm) Accommodates Standard Or Elevated Toilet Seats. Easy To Clean Aluminum Frame Mounts Securely Onto Bowl With Adjustable Bracket 18"-24" (46-61Cm). Available In Attractive Retail Packaging. Height Adjustment Armrest To Floor: 26"-31" (66-74Cm); Width Adjustment Between Armrests: 8"-24" (46-61Cm); Overall Depth: Arm 16.75" (43Cm), At Leg 12" (30Cm); Weight 10Lbs (4.5Kg); 250Lbs (114Kg) Retail Package.